Whether you live on the coast, by a river, or just someplace that seems to get one too many rainstorms, flood insurance can help protect your home and possessions from this common source of property damage. Homes and businesses located in communities that participate in the National Flood Insurance Program (NFIP) are eligible for flood insurance at a modest cost through this federal program. Under this program, insurance companies issue flood insurance and the federal government administers the program. Flood insurance normally requires a 30-day waiting period before the insurance is effective. But exceptions are made for certain circumstances-such as if you’ve purchased a home and the closing is in less than 30 days. If you own property in a special flood hazard area and have a mortgage, federal law normally requires you to have flood insurance. Even if you are not required to purchase flood insurance, your home may still be at risk for floods. Many people think that flood insurance is just for properties on the water, like beach-houses. But unfortunately because of factors like the shape of surrounding land, the type of soil, and weather patterns, you don’t have to have a view of the beach to be at risk for flooding. Flood insurance covers the structure of your home and your personal property in the event of a flood. 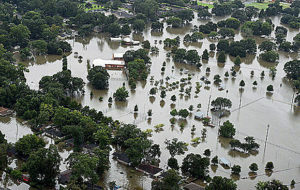 Typically long, heavy rain leads to the type of flooding that is covered by a flood policy. However, there are other ways that a home can sustain water damage (such as a pipe bursting in the wall) that are not usually considered floods so you should be sure of what your home or renters insurance policy covers.